I've always painted and drawn although it was only in adulthood that I produced anything I would actually show anyone. As with most children, crayons were my first medium of choice. Although when they disappeared as punishment for having used them on the living room walls I found that carving imagery into the soft wood of my headboard a good substitute. Once I began taking formal art instruction at local art schools I started out painting with oils and eventually transitioned to acrylics. After a long break to attend college and begin my business career, I decided to start taking art lessons again. Thanks to a good friend who insisted our next class had to be in watercolor I started a whole new path in my artistic career. I purchased all the supplies, went to the class grumbling all the way and sure I wouldn't enjoy it. When the instructor said it was time to clean up however, I was sure only ten minutes had passed. A check of my watch confirmed that indeed three hours had passed. I was mesmerized by the medium and hooked by its unique properties. I continue to be blessed with instruction from a number of extraordinary watercolorists. As an instructor I am continually excited and challenged to explore watercolor with new eyes as well as renewed by each students' growth process. 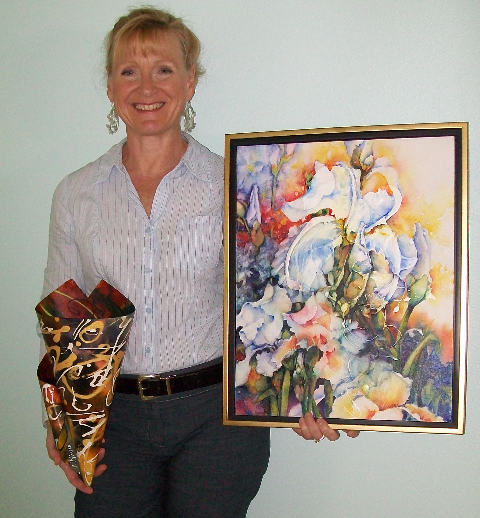 2007 - Present: Full time role as artist, exhibitor and watercolor instructor. 2004 - 2006: As licensing agent, represented the work of various artists at industry tradeshows, and developed customized marketing plans for each artist to source licensing opportunities. 2002 - 2006: Consulted small and mid-size companies; services included but were not limited to matters concerning sales rep management and performance; key accounts; licensing opportunities; annual sales and marketing planning; and customized market trend analysis. Reversed declining sales and increased revenues by 10% or more annually. Built sales through the successful management of sales rep network, 120 strong, in Canada and the U.S. as well as national accounts such as Target, Barnes and Noble, Nordstrom Rack and Linens and Things. Managed all regional and national tradeshows on behalf of the company and its sales rep teams. Improved customer care through a close partnership with customer service and scheduled customer contact and follow-up. Responsible for all catalog mailings and development of sales programs and promotional materials. Regularly reported marketplace trends affecting product development, sales plans, pricing and product options as gathered from retailer and sales rep feedback as well as personal observation to the creative team and senior management. Established program pricing for all new and revised products. Created a training manual for all sales representatives; conducted semi-annual sales meetings with each sales team; provided product training sessions and conducted field visits with individual sales reps and sales groups as needed. Designed a compact sales kit that made the process of presenting over 6,000 sku's of product easier and more effective. Improved sales reporting and communication tools that allowed sales reps to be accountable for and capable of tracking their progress in attaining annual sales goals for their territory. Developed and executed a sales and marketing plan that more than doubled the company's annual revenues in less than nine months. Built a nationwide sales rep network. Created and implemented sales programs that increased sales and streamlined the selling process. Created a regularly published newsletter to improve sales rep communications and awareness. Managed seven tradeshows and generated sales that covered costs by 150-400% and achieved a 60-80% new account ratio. Identified strategies and developed annual plans for product lines ranging from $300,000 to $21,000,000 in annual sales, including a plan to reverse the double digit decline of a mature product line within one year and positive growth with each subsequent year. Forecast annual revenues and developed budgets for each product line to meet annual objectives. Led multi-functional task teams to assess and resolve major operational issues, including a project requiring a needs assessment and resulted in the redesign of a computer based sales tool that significantly improved accuracy, customer service speed and customer satisfaction. Negotiated solutions between disparate groups to improve product quality and/or production processes, including an effort that unified senior management, vertical market managers and production managers on a plan to phase in a product quantity change that more accurately met the needs of the small business customer and improved top line revenues. Divested three non-strategic product lines by developing sales proposals, identifying four qualified buyers, resulting in a purchase agreement within the allotted three month timeframe. Also managed transition to the new owner. Major in Industrial Technology, Graphics.